The Old Town Farmer’s Market provides some of the freshest, healthiest and sweetest tasting fruits and vegetables around the St. Louis area. Located at the First Block of South Charles in Downtown Belleville between Grimm & Gorly and Papa Vitos every Saturday May through November 3rd from 7:30 am until noon. 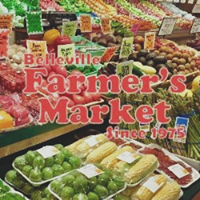 The farmer’s market provides the city of Belleville with the freshest foods. Each week the selection varies as they only sell locally grown produce, ensuring that their customers are only receiving the best of the best! Not only does the market supply fresh produce, they also provide entertainment for everyone in the family. A live musical performance featured every weekend from 9 am until noon gives everyone a chance to embrace the music. The farmer’s market also includes several children’s activities brought together through the efforts of local neighbors and not-for profit organizations. Some of the different selections at the Old Town Farmer’s Market include a wide selection of locally grown produce, pasture raised beef, lamb and pork, bakery products, honey, longhorn summer sausage, crafts, and even dog treats. For more information regarding the Old Town Farmer’s Market please visit, https://www.bellevillemainstreet.net/old-town-market.